So if you've read my blog for any amount of time, you've no doubt read about my struggle with prayer. For some reason, I always feel like I struggle with prayer and the right words to say. 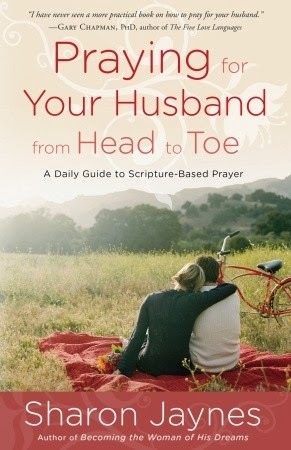 This book has been a tremendous asset in showing me how to pray for my husband. Sharon Jaynes witnessed first hand what praying for a man could do. She saw her prayers for her father answered as he eventually turned towards God and away from destructive behavior. Jaynes had also seen the effect her prayers had in the life of her husband. She wrote Praying for Your Husband from Head to Toe to help other women learn how to pray for their husbands without trying to control God and their husbands in the process. The author has broken each thing down from what your husband sees, his strength, etc. Then she incorporates all of these things into 30 prayers. I think the part that I have liked the most is how she talks about how sometimes prayer is all you can do and that it really does change how you think about your husband. I know that God is powerful and I know that talking to Him about my husband is one of the best things I can do for him and our marriage. I highly recommend this book!